1. Leopard jacquard trousers, Oasis, £45. 2. Miu Miu leather shoulder bag, Net-a-porter.com, £550. 3. See by Chloe purple tiered top, The Outnet, £144. 4. 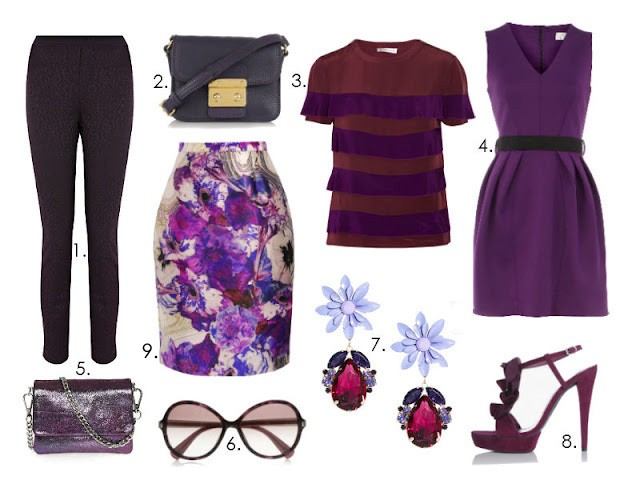 Closet v-neck purple scuba dress, Dorothy Perkins, £40. 5. Lollidrop mini bag, Kurt Geiger, £80. 6. Marc Jacobs oversized round sunglasses, The Outnet, £92.50. 7. Flower & jewel drop earrings, ASOS, £15. 8. Iman purple platform sandals, Stylistpick, £35. 9. Prabal Gurung printed pencil skirt, Browns, £335.